The warm breeze blows through the paperbarks and casuarinas, the familiar sound and scent of the Australian bush fills the air. I close my eyes; the temperature is warm and I listen to life around me. Whether you are a visitor or born and bred, I sense a familiar response is echoed from those who enter the Byron Yoga Retreat Centre. A place of solidarity, where a landscape for coming home to your authentic self is offered. I am waiting for John Ogilvie, the founder. John arrives, radiating a happy and calm energy. This meeting starts my journey into writing about the interconnectedness of yoga and the environment which we all share. Our rare blue planet Earth. Softly spoken, John expresses, “when you pass through the entrance of the Byron Yoga Retreat Centre you leave the material world behind and enter an embassy, a spiritual oasis…”. An embassy where yogis are available to guide you on your yoga journey. Byron Yoga Retreat Centre is nestled amongst 30 acres neighbouring the southern boundary of the Belongil-Cumbebin wetland forming part of the Cumbebin Swamp Nature Reserve, located adjacent to the township of Byron Bay on the far north coast of New South Wales, Australia. Originally, John founded Byron Yoga Retreat Centre during 1987 at the Epicentre, Belongil Beach, Byron Bay. Formerly a whaling meat works, John explains the Epicentre was subject to a large number of cleansing purification processes and the Byron Yoga Retreat Centre was officially launched in 1998 making the Centre one of the longest running Yoga Centre’s in Australia owned by its founder. With developers moving into the Epicentre in 2009, John was introduced to a site on Skinners Shoot Road, Byron Bay, which now houses the Byron Yoga Retreat Centre. Historically, this site was previously cleared of vegetation and used as a holding ground for livestock, an airfield and then a racetrack for training trotters. Soil was then transferred from a dam in the nearby foothills to the site about 15 to 20 years ago. The soils were compacted, raising the site to accommodate buildings. The surrounding area contains wetlands of state significance, sensitive coastal dunes, coastal swamp forests and riparian areas. It contains three endangered ecological communities, which provide habitat for a wide range of native animals including threatened species such as the Black-Necked Stork (Xenorhynchus asiaticus); Koala (Phascolarctos cinereus); Large-Footed Myotis (Myotis macropus), and Little Bent-Wing Bat (Miniopterus australis). The landscape of Byron Yoga Retreat Centre and its greater surrounding area is made up of many features that are interconnected. These include the land, waters, plants, animals, special places, stories, historical and current uses, the Bundjalung of Byron Bay (Arakwal) people, other Bundjalung people and their interactions with each other and place. These features are seen as inseparable. John’s smile broadens when asked about his connection to land and then articulates that his is, “a custodian relationship where he has a sense of responsibility for taking care of and protecting the land and leaving the landscape better than when he arrived. This principle applies to Byron Yoga Retreat Centre and the planet as a whole”. John’s fundamental beliefs deeply affects all the decisions that are made at the Byron Yoga Retreat Centre and is an advocate, “to be the change that you want to see in the world”. With a deep belief, John expresses, “the purpose of human life is to be the best version of ourselves and that Yoga is an optimal vehicle to achieve that outcome”. The word yoga means to “yoke”, or, in other words, to unify. When our external environment and bodies unify and work in harmony, we are then able to start to experience peace, creativity and longevity. John says, “as the benefits of yoga start to ripple out you start to feel you again. It’s from this place that we can discover how to become the best version of ourselves, and how to start to live a sustainable life for ourselves, the community which we live in and planet Earth as a whole”. Johns elaborates, “when we talk about human philosophy, we talk about the principles of the eight limbs of yoga, the yamas (a universal ethical discipline), niyamas (an individual ethical conduct) and samadhi. Reaching that state of samadhi is when we become the best version of ourselves”. I explore further, “how do we reach the state of samadhi?”. John explains further, “the process to achieve the best version that we can become of ourselves is by focusing on growing, improving and changing. Decisions need to be made on those principles to help us meet those outcomes. That’s why I practice yoga and why I founded and have grown the Byron Yoga Retreat Centre. The process of growing, improving and changing by using yoga as a vehicle is accelerated when we are actually helping other people achieve that outcome for themselves”. I question, “how does becoming the best version yourself relate to the environmental evolution of the Byron Yoga Retreat Centre?”. John explains that, “Retreat is essential. We know we are moving too quickly in life and this is proven by elevated levels of cortisol in the human race. It’s proven that we have higher baselines of cortisol than we had previously as we are trying to do too much too quickly. Providing a place to retreat from that rapid pace of life is what Byron Yoga Retreat offers. It is why it is here”. “When we are in our comfort zone we kick back and we are not motivated to do anything to be motivated, changing or improving. When we are outside of our comfort zone then we are motivated to think that something is not quite right and what am I going to do to change things, what can I do to improve things, what knowledge do I need to gain”. As a past student, I agree. My time spent at the Byron Yoga Retreat Centre took me out of my comfort zone and allowed me to take a break from the material world. I asked myself, “what are we doing to each other and the planet?”. Yoga is the vinyasa of life in every moment, every action and every breath. On and off the mat. To go above and beyond the material world I was then able to unify and align with the natural rhythms of the planet again. The only thing we can change is our self. One person can make a difference. Absorbing the sounds and aroma of the kitchen during our conversation, I gaze across the greenspace and beyond the pool to the organic vegetable garden. “This is the source of food”, John says, “for the onsite kitchen where sattvic dishes are created for guests”. The body is the divine temple of the soul and we should care deeply about what we feed ourselves. A sattvic diet not only means vegetarian food, but properly prepared seasonal fresh organic food rich in prana ‘life-force’. The buzz of the bees in the garden reflects the buzz of life throughout the Byron Yoga Retreat Centre. From gathering food from the garden, food preparation in the kitchen, the capture of drinking water, the reuse of water on avocado and bananas trees, composting toilets, no chemical policy and water and waste reduction strategies. John says, “guests are encouraged to live in alignment with these values that minimise their footprint on the planet”. As we complete our time together, I take a breath of clean air and honour this sacred Earth. 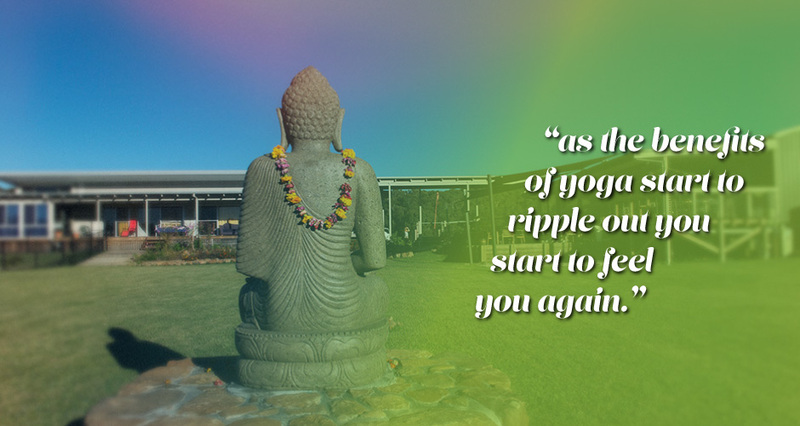 This oasis, the Byron Yoga Retreat Centre, is committed on providing the tools to truly live a connected and expansive life. I believe the solidarity of all mankind is necessary to preserve the environment. We all have an ethical responsibility to create a civilised humanity, favouring its permanent improvement and happiness. Humans have a tendency to separate themselves from the rest of the ecocosm by using terms such as ‘natural’ and ‘wild’. However, humans are the most critical and integral component to the ecocosm at this point in history. We are responsible stewards of our bodies and the planet; it’s crucial that our choices and actions are harmoniously aligned with the Earth. Perhaps the Byron Yoga Retreat Centre has its’ finger on the pulse of the interconnectedness of yoga and the environment. The environmental evolution of the Earth and yourself is as transient as the clouds and in this moment in time it is renewed. I believe you are your own self-sustaining ecosystem. Live from your heart and give to this life who you really are. Honour your life, yourself and find a way to live in harmony with the planet. Brigita Katia Arrowsmith is a certified 200-hour Yoga Teacher and Environmental Scientist, fitness, clean eating health advocate and super mum. But most of all she is passionate about helping people connect with their own inner compass and the environment which we all share. Brigita brings to the table a respect for nature and the environment.